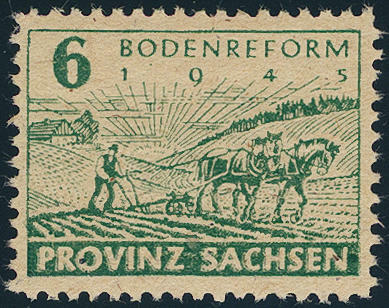 6122 85/86xaA Land reform 1945, both values with lines perforation 11 ½ from post office Wittenberg Luther town, fresh colors and very well perforated, in perfect condition mint never hinged, photo expertize \"genuine and immaculate\" Ströh BPP. 6123 ⊙ 85wbD 6 Pfg. 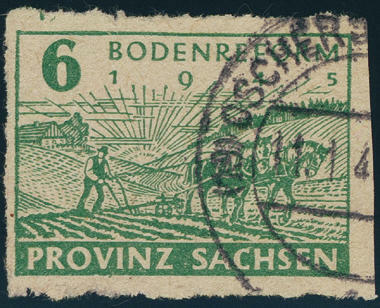 Vivid green rouletted from post office Oschersleben, fresh colors and neat cancelled \"OSCHERSLEBEN 11.1.46. \", very rare, photo expertize \"genuine and immaculate\" Ströh BPP. 6124 85yaA 6 Pfg. 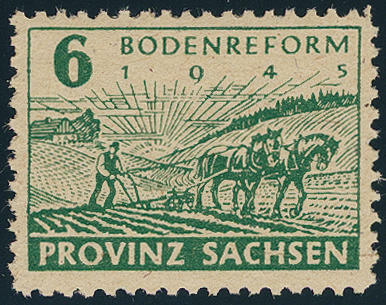 Dark bluish green with lines perforation 11 ½ from post office Wittenberg Luther town, in perfect condition mint never hinged, photo expertize \"genuine and immaculate\" Ströh BPP. 6125 ✉ 86POL 12 Pfg. 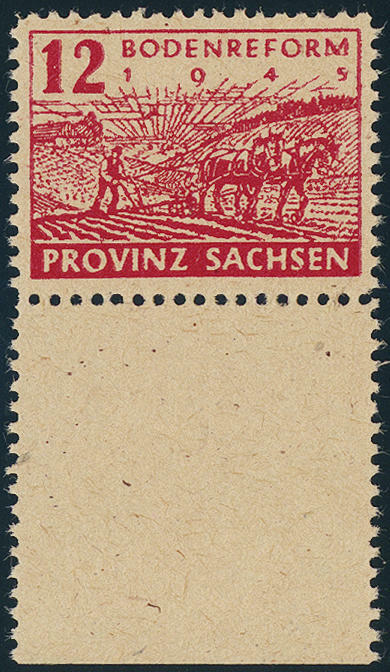 Land reform cut with vertical \"Pole punching\" on very nice, commercially used cover from police chief in Halle with two ring cancel \"HALLE 9.1.46. 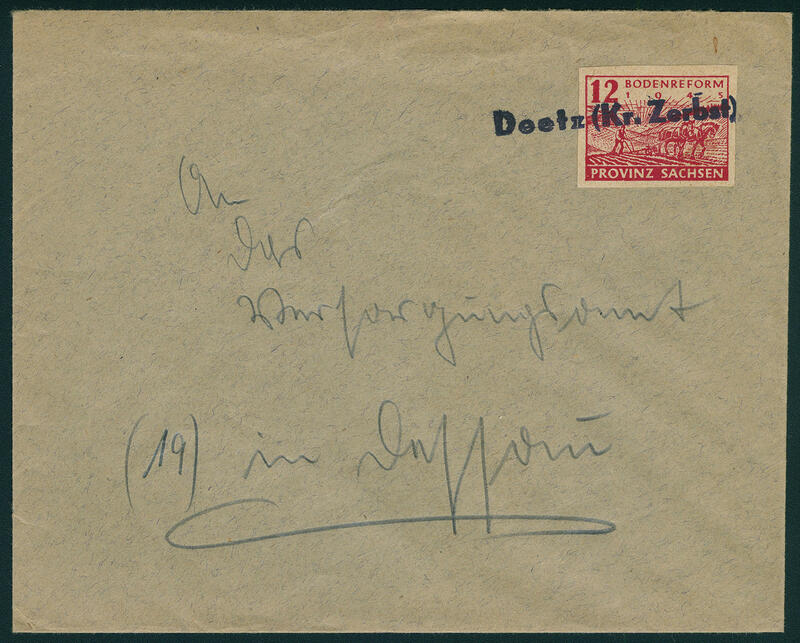 \" to Leipzig to the head mayor. The cover was from the third Reich taken over, whereby the former Imperial Eagle removed was. 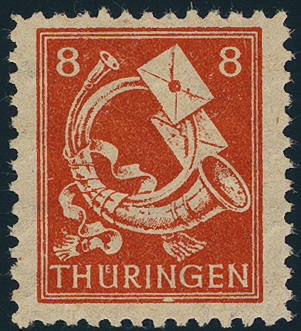 There are only few commercially used letters of this issue with Pole punching have become known, which here is a particularly beautiful example! 6126 ✉ 86wa 12 Pfg. 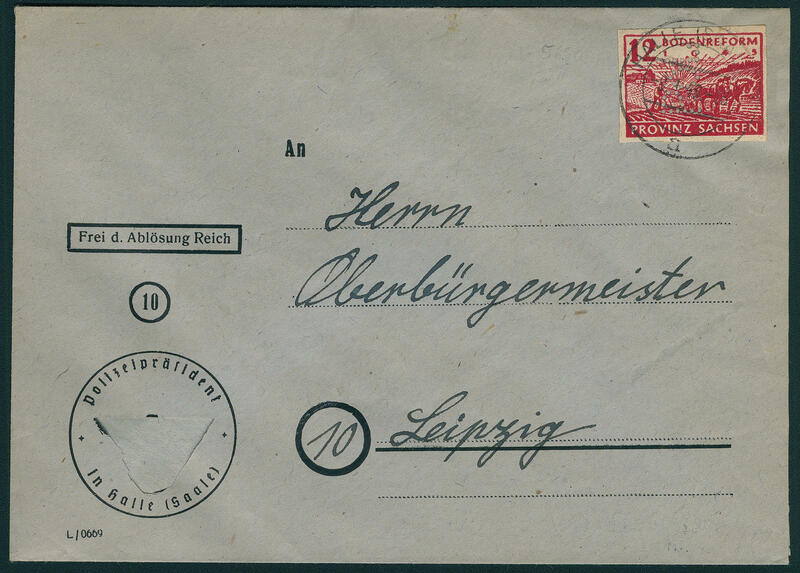 Land reform cut, large margins all around and in perfect condition as correctly franked single franking on cover with scarce pricked clear provisional cancel \"DEETZ (KR. ZERBST) \" to Dessau. There are only few documents with this provisional cancel have become known. Photo expertize \"genuine and immaculate\" Ströh BPP. 6127 91bW 12 Pfg. 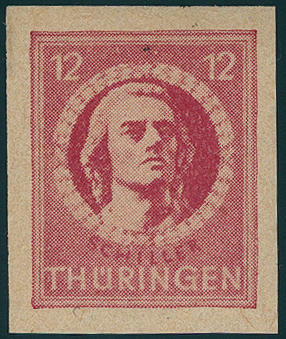 Bright rose on so-called cigarette paper watermarked W, perforated 13:13 1 / 4, fresh colors and extraordinarily good perforated from left margin of sheet, in perfect condition mint never hinged, without any signs. An extraordinarily scarce issue, the in almost all collections is absent and especially in this excellent quality hardly ever offered becomes! 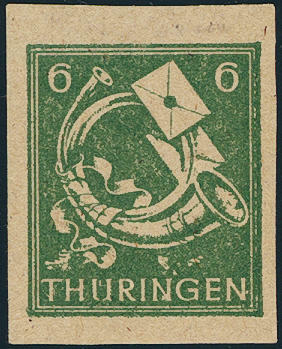 Another copy, however without margin of sheet and neither in such perfect perforation obtained in of our 75. 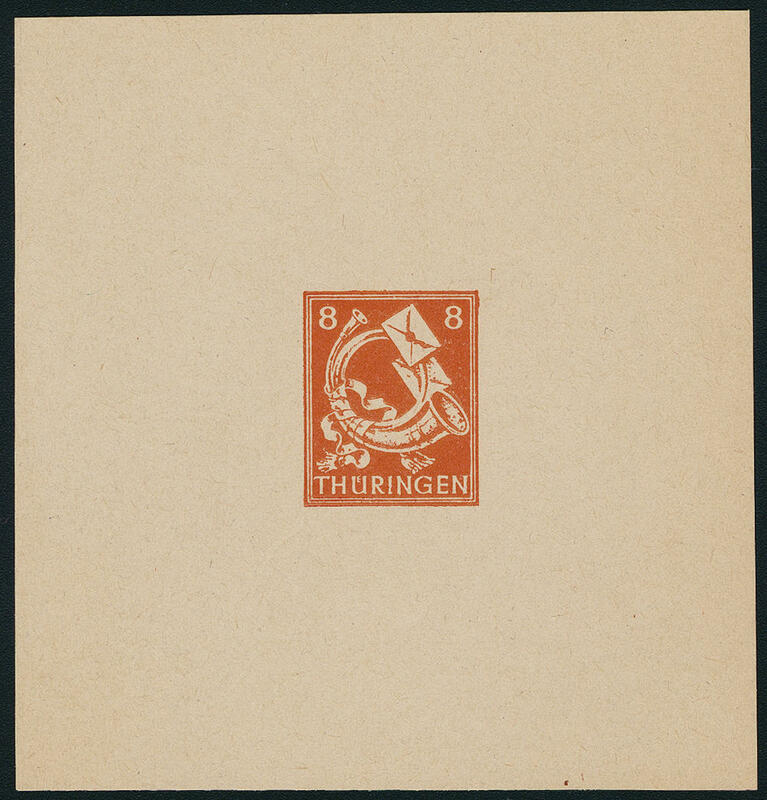 Auction a surtax from 3900,- €. Photo expertize \"genuine and immaculate\" Ströh BPP. 6128 94/96AYySKZU 5 Pfg. Dark emerald green se-tenant with 8 Pfg. Red orange, vertical tête-bêche pair with gutter, unperforated, type of paper y, economy gum, in perfect condition mint never hinged and unfolded. These tête-bêche pairs were over the philatelic agency in Erford sold and samples postally valid. Especially in this excellent quality extraordinarily rare. Photo expertize \"genuine and immaculate\" Ströh BPP. Michel 1300,- €. 6129 94PI 5 Pfg. 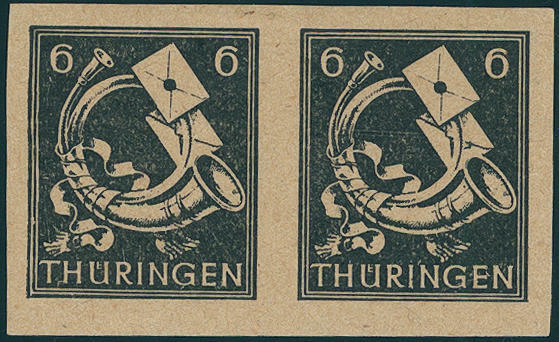 Postal stamps 1945, proof the Ohlenrothschen printing plant in Erford in black on ungummed Chrome grandpa pi, unperforated in the horizontal pair, two horizontal creases. 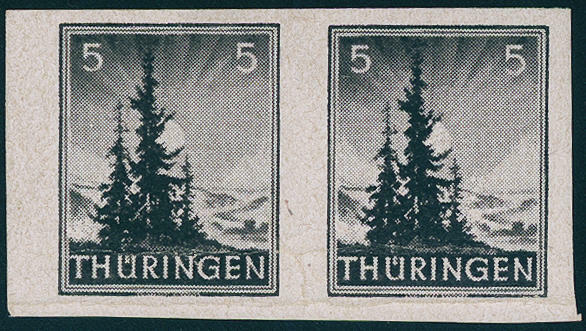 There are only few examples from this known, as a pair a pronounced Soviet Zone rarity! Photo expertize Ströh BPP. Michel 2000,- €. 6130 94PI 5 Pfg. 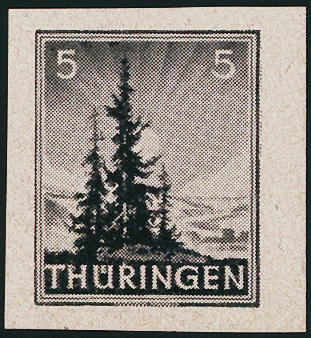 Black, proof the Ohlenrothschen printing plant in Erford, in perfect condition on ungummed Chrome grandpa pi, large margins all around in perfect condition. There are only few examples from this known. Photo expertize \"genuine and immaculate\" Ströh BPP. 6131 95AXavWZU 6 Pfg. 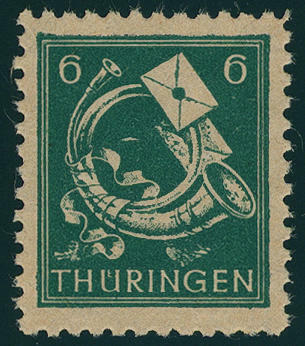 Dark green, horizontal gutter pair unperforated in the type of paper v, with smooth gum, wonderful fresh colors, large margins all around, unfolded, in perfect condition mint never hinged these gutter pairs were over the philatelic agency in Erford sold and samples postally valid. Especially in this excellent quality extraordinarily rare. Photo expertize \"genuine and immaculate\" Ströh BPP. Michel 1300,- €. 6132 95AYbyy 6 Pfg. Blackish blueish green on thin, yellowish gray paper, economy gum, fresh colors and in perfect condition mint never hinged, a scarce issue, photo expertize \"genuine and immaculate\" Ströh BPP. Michel 800,- €. 6133 95AYdz2U 6 Pfg. Black opal green, thick, gray white paper with steep falling paper pattern of stripes or streaks, economy gum, unperforated, in perfect condition mint never hinged a significant Soviet Zone rarity, in the Michel special catalogue unlisted. Photo expertize \"genuine and immaculate\" Dr. Jasch BPP. 6135 96AYyy 8 Pfg. 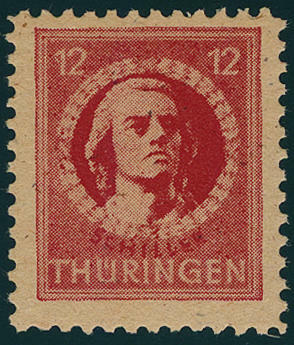 Red orange on thin paper, in perfect condition mint never hinged, photo expertize \"genuine and immaculate\" Ströh BPP. 6136 96AYz1 8 Pfg. 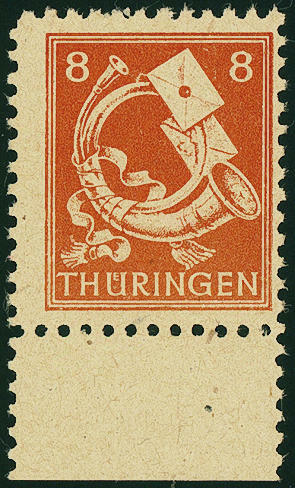 Orange red, economy gum, rare paper with steep increasing paper pattern of stripes or streaks, fresh colors and very well perforated from lower margin, in perfect condition mint never hinged a SBZ-rarity! Photo expertize \"perfect quality\" Herpichböhm BPP. Michel 3000,- €. 6138 97AXav 12 Pfg. Carmine red, scarce type of paper v, fresh colors and in perfect condition mint never hinged, expertized Dr. Jasch BPP. Michel 550,- €. 6139 ⊙ 97AXbat 12 Pfg. 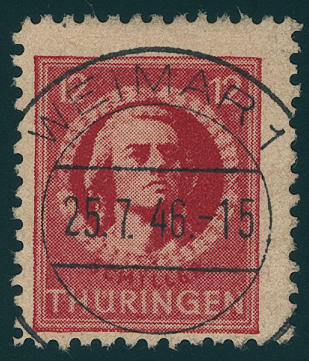 Dark brownish red on yellowish gray paper, wonderful fresh colors and especially nice centric and neat cancelled \"WEIMAR 25.7.46. \" in utterly perfect condition. The most beautiful us known copy of this rare issue! Photo expertize \"genuine and immaculate\" Ströh BPP. 6140 ⊙ 97AXbat 12 Pfg. 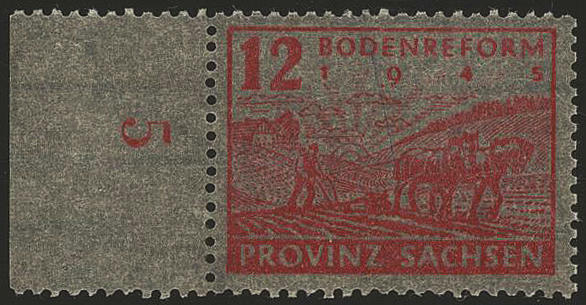 Dark brownish red on yellowish gray paper with fine network structure, fresh colors and especially nice centric cancellation \"Erford 12.2.46. \", an exception copy, photo expertize \"genuine and immaculate\" Ströh BPP. Michel 550,- €. 6141 97AXbatU 12 Pfg. 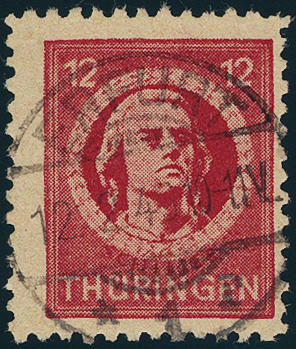 Dark brownish red, unperforated instead of perforated, type of paper t, in perfect condition mint never hinged the stamp luminous under ultraviolet light dark brown red. Very rare! Photo expertize \"genuine and immaculate\" Ströh BPP. Michel 800,- €.